My boys and I are now Italian dual citizens. After 10 months of hard work, we received our letter today, dated May 24, 2012. 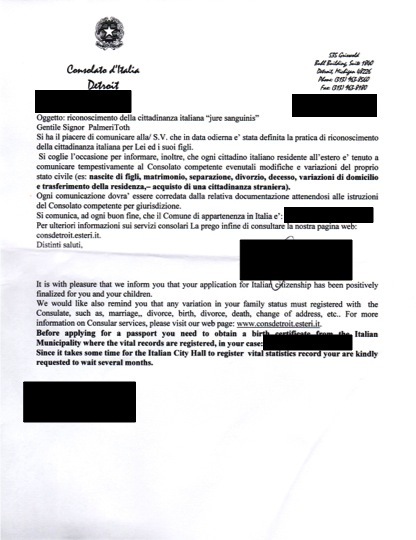 "It is with pleasure that we inform you that your application for Italian citizenship has been positively finalized for you and your children." 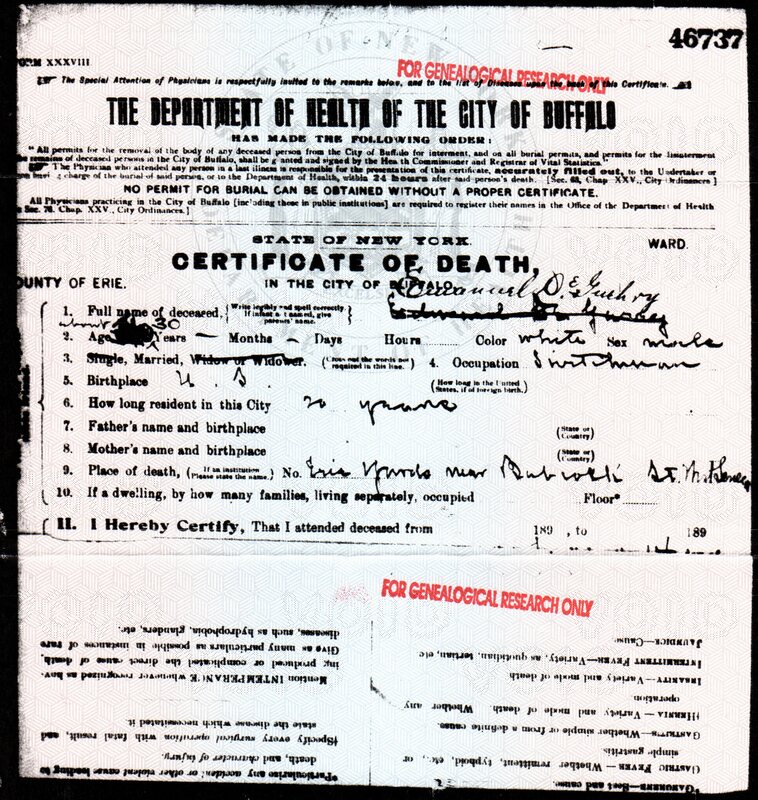 This is the death certificate for my great-great-grandfather, Emanuel De Guehery. He was killed in a railroad accident in 1894 at the age of 30, leaving his wife Marion to take care of six children, including a newborn. Some of the children went to live with Marion's family back in Chalk River, Ontario, until the family could be reunited several years later. This gives some of the gruesome details of his death. The chief and determining cause of death was "body crushed and cut to pieces". Consecutive and contributing cause was "RR Engine". 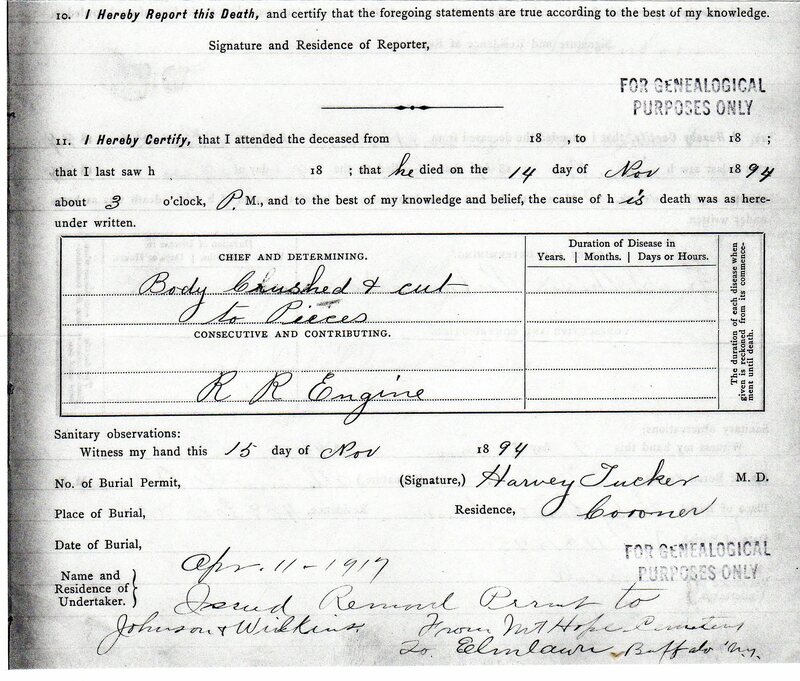 I received the death certificate for my great-great-grandfather, Emanuel De Guehery today. Not a lot of new information on it. Emanuel De Guehery worked for the railroad and was killed in an accident on 14 Nov 1894. “RAILROADER KILLED Edward de Guehery Caught his Foot in a Frog in the Erie Yards and was Shockingly Mangled. Another railroader met his fate in the Erie Yards at East Buffalo yesterday afternoon. About 4 o’clock Edward de Guehery, a conductor for the Erie, was pulling pins near Babcock Street, when his right foot became caught in a frog. Before he could extricate it Engine No. 686 bore down on him and killed him instantly. He was shockingly mangled. 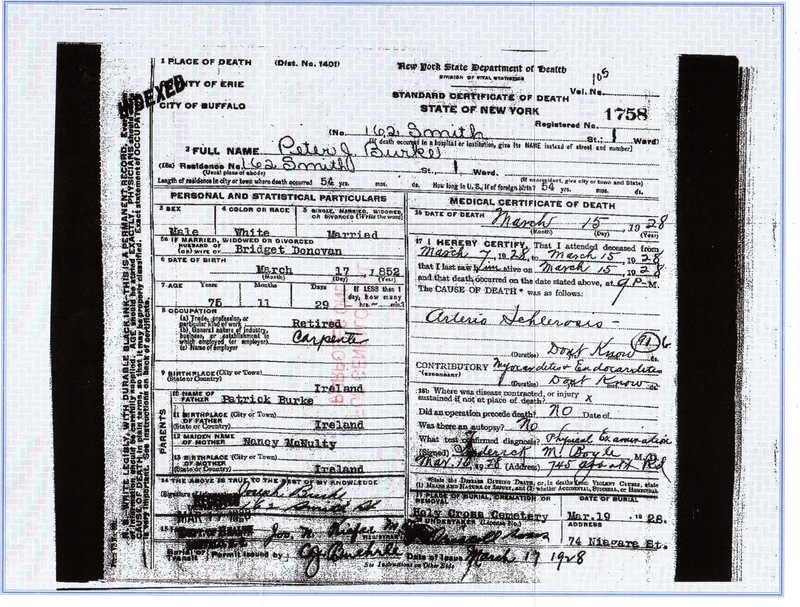 The death certificate may explain why the story refers to "Edward" instead of "Emanuel". Since this was an accident, perhaps someone at the railroad yard – a supervisor perhaps – thought his name was Edward since the death certificate initially said "Edward DeGuehery". That was crossed out and "Emanuel DeGuehery" was written in its place. Clearly, they didn't get information from his wife since there is nothing written for father's name (Rudolph) and mother's name (Gottlieben/Katherine). “By Resolution of Hobab Lodge No. 681, I.O.O.F. Whereas, Our worthy brother, Emanuel de Guehery, aged 30 years, while employed as a conducter in the Erie yards at East Buffalo, came suddenly to his death on Wednesday afternoon. Resolved. The Hobab lodge feel with deep regret the loss of our brother, who leaves a wife and six children, the oldest 10 years and the youngest 5 weeks, to whom we extend our heartfelt sympathy. According to Dinty's genealogy, "This must have been a tremendous shock to Marion to be widowed at age 30 with six children. She was a small woman, and rather frail, but she must have had a mighty strong spirit. Her brother, William Cuthbert, of Chalk River, immediately came to Buffalo by train, and made the funeral arrangements. Marion decided she would have to go to work to provide for her children. She chose to train as a nurse. Uncle Willie, as he was known, took five of the children back to the farm in Chalk River, by train, leaving Marion to care for her 6-week-old Edna, and commence her nursing training." 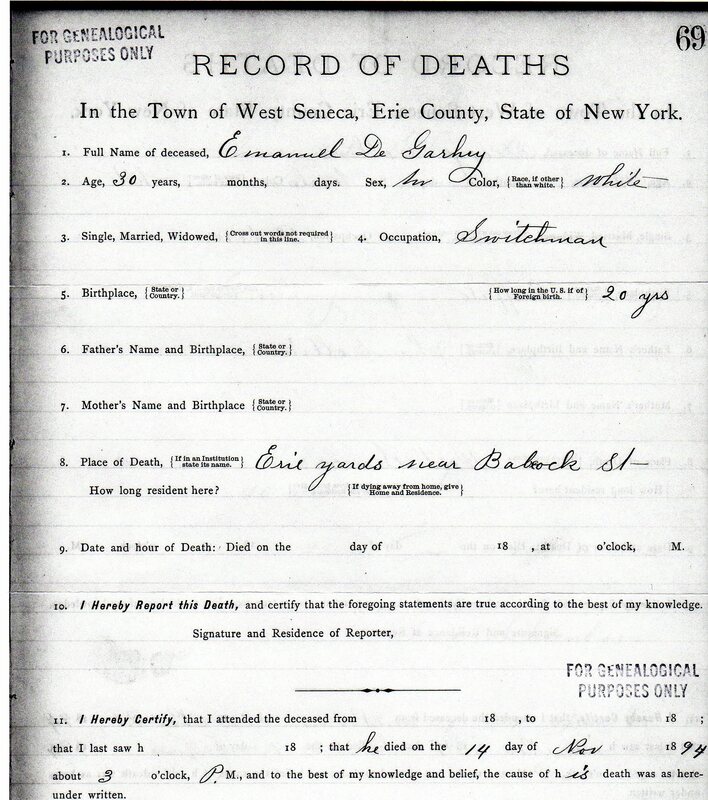 Today I received the death certificate for my great-great-grandfather's brother, Peter J. Burke, from the City of Buffalo. This also lists my great-great-great-grandfather as Patrick Burke, and it lists by great-great-great-grandmother as Nancy McNulty – my great-great-grandfather's listed her name as "Ann" not "Nancy". It gives his date of birth. Perhaps someday I'll be able to use this to find some Irish records. I tried a copy of online search tools, but none turned up him or my great-great-grandfather. When I found the obituary for my great-great-grandfather, Anthony Burke, it listed that his service was going to be in St. Stephen's RC Church in Buffalo. That church is now St. Clare's, so I wrote them asking if they had any information. Someone wrote back and said, "I was able to take some time today to look into the request you've made on April 24th. Anthony Burke is recorded in our Death Register, no age was written, said he died on January 3, 1931 from heart condition, I found it interesting that under the priest name whom celebrated the funeral mass it read, Rev. Joseph Burke, (was his brother a priest)"
It's almost certain that this "Rev. Joseph Burke" was the person who later became Bishop Burke of Buffalo. He would have been in his mid-forties around that time. He became Bishop in the 1950's and died in 1962. She also said, "Also found death record of Peter J. Burke, died March 15, 1928, age 75, reason for death read hardening of the artieries, under priest again read Rev. Joseph Burke, I think this might be the brother, because a different priest name is on the others registered on that page." That is probably Anthony's brother Peter. So now I have a birth year and death date to see if I can find some more information about the Burke family. Unfortunately, there was no information (so far) from them about Maria or Anna (Brady) Burke. I mailed my certified/legalized certificates back to the Detroit Consulate a few weeks ago. Yesterday I emailed just to ask what the next step might be and whether there was anything I need to do and whether and when I would learn about my dual citizenship. Response was characteristically terse: "You will receive a letter in the mail". 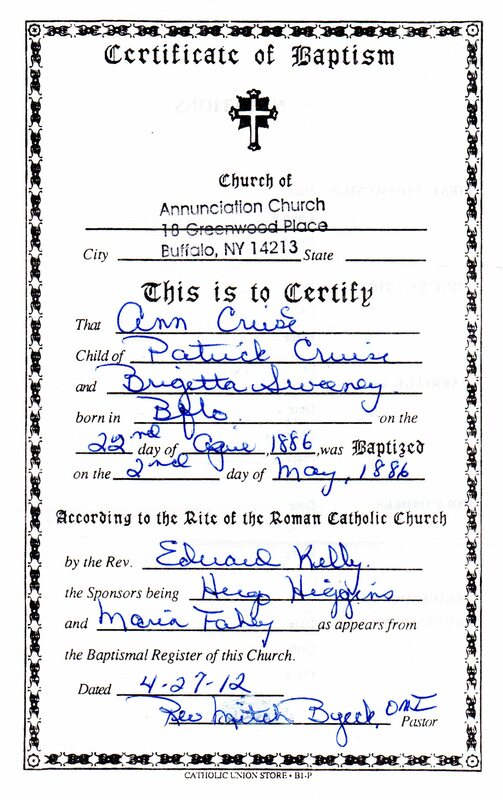 Received baptism from my great-grandmother, Anna Cruice. She was born 22 Apr 1886, baptized 2 May 1886 at Annunciation Church. From this record, it appears that the name could be spelled Cruice or Cruise. And my great-great-grandmother is Brigetta Sweeney (I've had Bridget). Annunciation is now Our Lady of Hope in Buffalo.